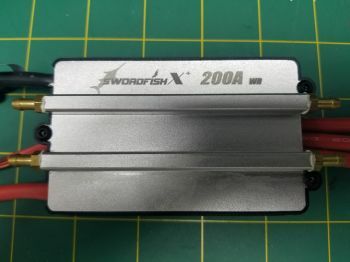 Hifei Swordfish Pro 200 amp water cooled esc. This is a high quality ESC designed specifically for racing boat. Programming can be done with the included program cable (Requires Windows PC) or optional Wifi dongle (not available at this time). 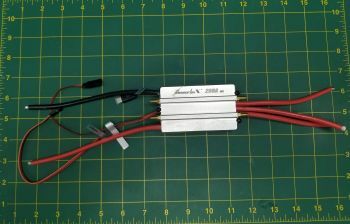 200 Amps, 2s to 8s LiPo Cells, Built in BEC*. -Built-In Data Logger (record critical parameters: Current/Voltage/Motor RPM/Temperature/Throttle Travel), with included program cable* or optional WIFI dongle. -Integrated the double water cooler. -Conformal coating on circuit board for resistance to water. Not submersible. -Safe 'power on' arming program ensures motor will not accidentally turn on. -Auto shut down when signal is lost or radio interference becomes severe for more than 0.1 seconds. After radio connection has been re-established, moving the throttle to the lowest position can restart the motor. Programming method: Using the included program cable* or optional HiFei Wifi dongle(Not available at this time).